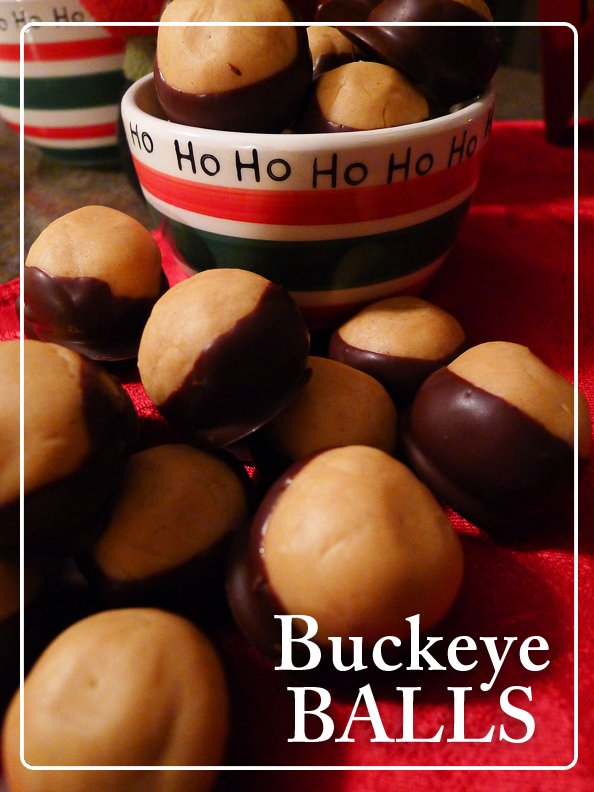 Buckeye Balls are one of those holiday treats that you will always remember the very first time you had one. They are just so good, they will make a lasting impression in your mind. And if you haven’t had them yet, what are you waiting for?? They are amazing! 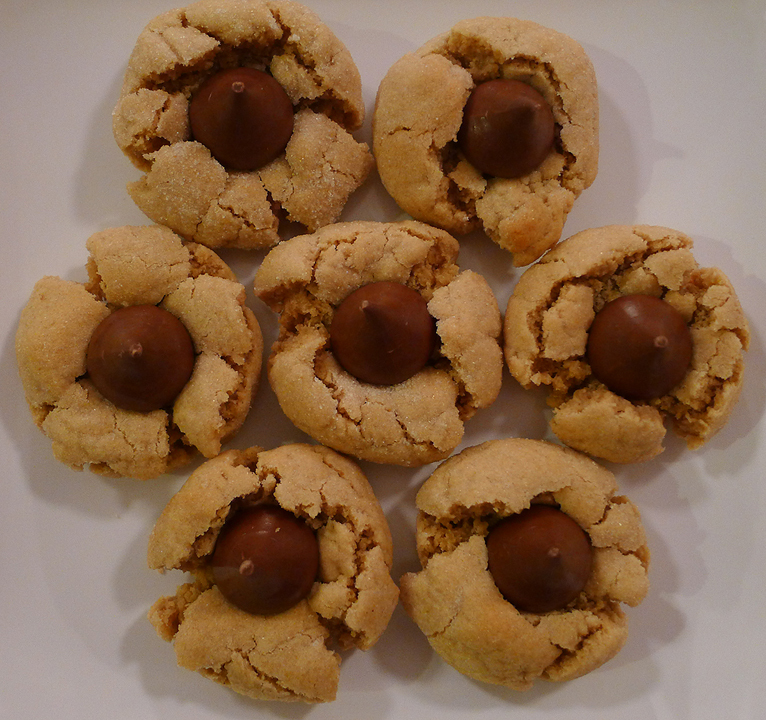 The peanut butter balls are so soft and wonderful. 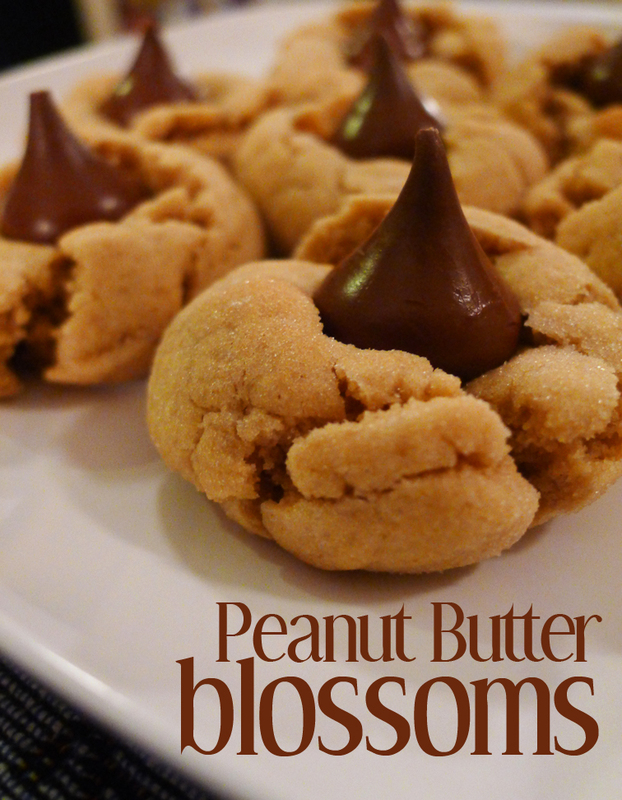 The chocolate coating on the bottom goes so well with the peanut butter, they will melt in your mouth. And then you will want another! 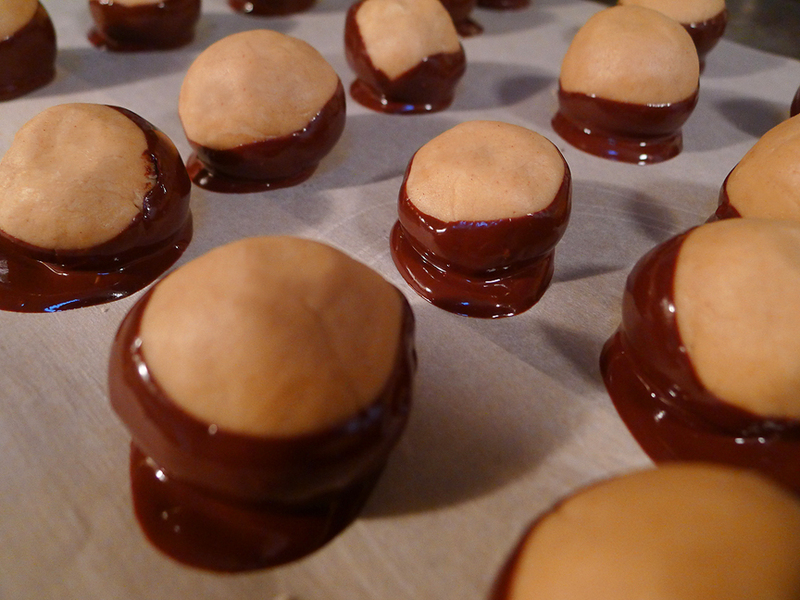 Making the peanut butter filling can be a bit tricky. Make sure you work the dough thoroughly. 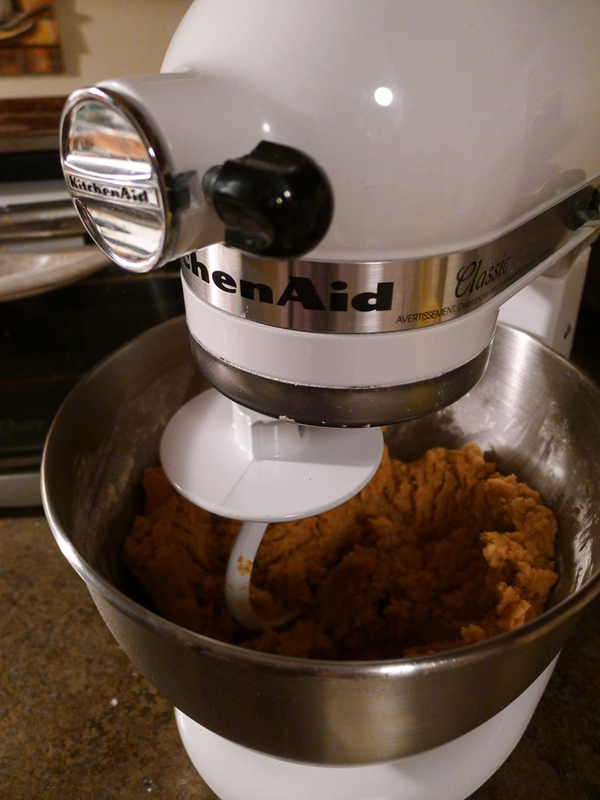 I use a Kitchen Aid and then use my hands to knead the dough a little more. 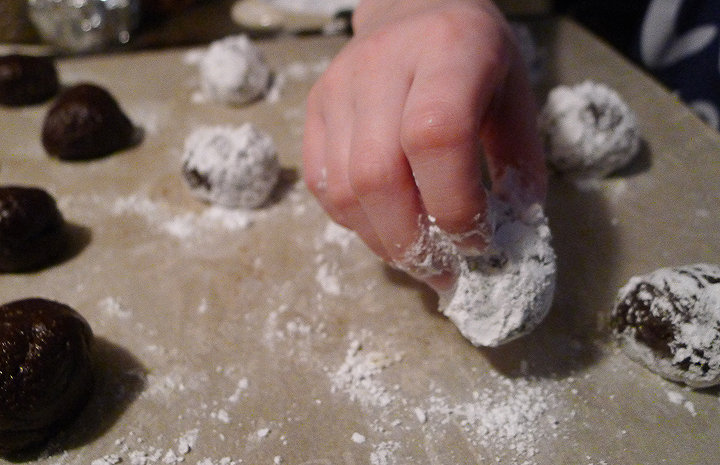 When you make the balls, they might be very crumbly if you don’t mix the dough well enough. This is an all-hands-on-deck kind of recipe. I bring anyone who is home, in to help form the peanut butter balls. Otherwise, it would take forever. 1. 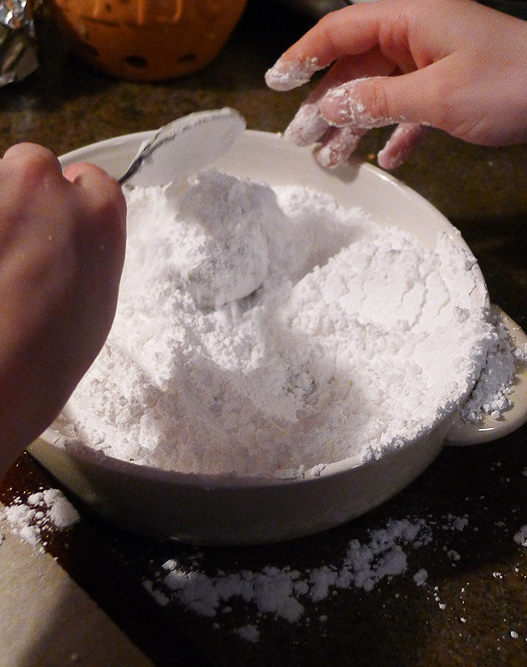 In a large bowl, mix together the peanut butter, butter, vanilla, and confectioners sugar using a Kitchen Aid mixer. It will be dry and crumbly at first, but keep working it until everything is very evenly mixed.You may need to knead it by hand as well. 2. 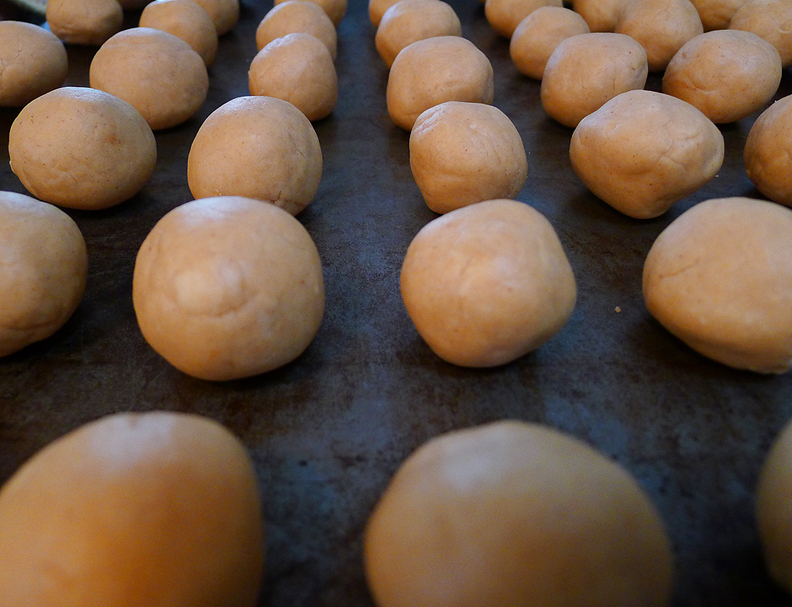 Form into 2 large balls, cover with plastic wrap and refrigerate for about 30-60 minutes. 3. 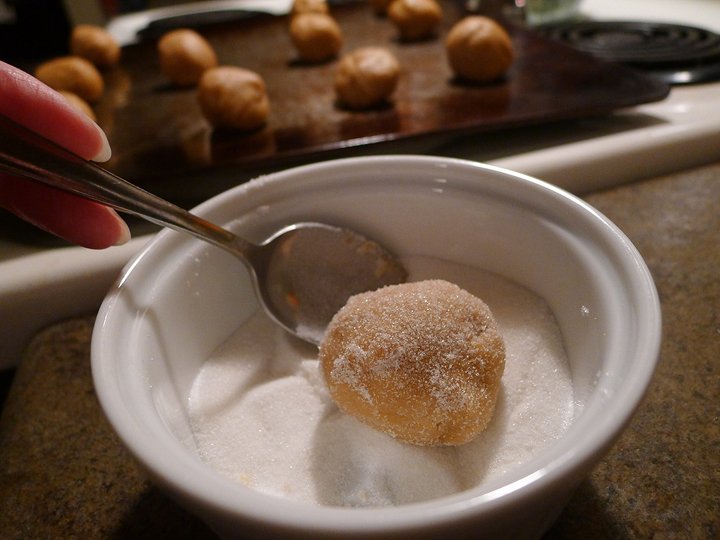 Shape into tablespoon sized balls. Roll them in your hands to smooth. Place on a baking sheet lined with wax paper. 5. 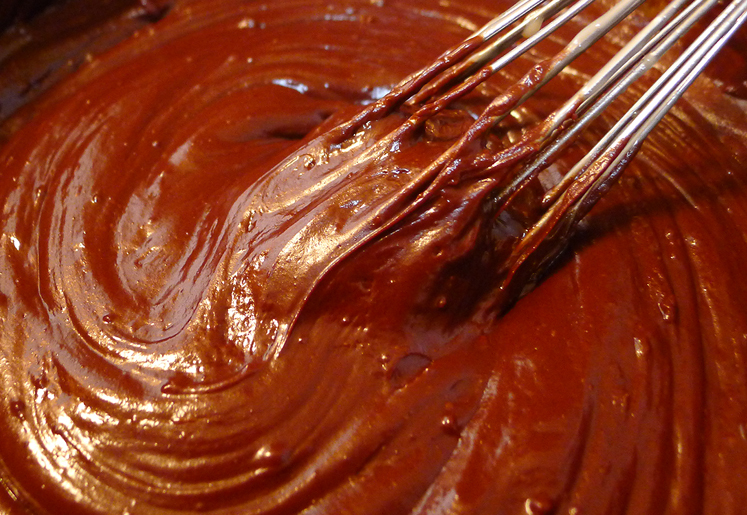 In a small saucepan melt chocolate chips and shortening over low heat, stirring constantly. When smooth, remove from heat. 6. 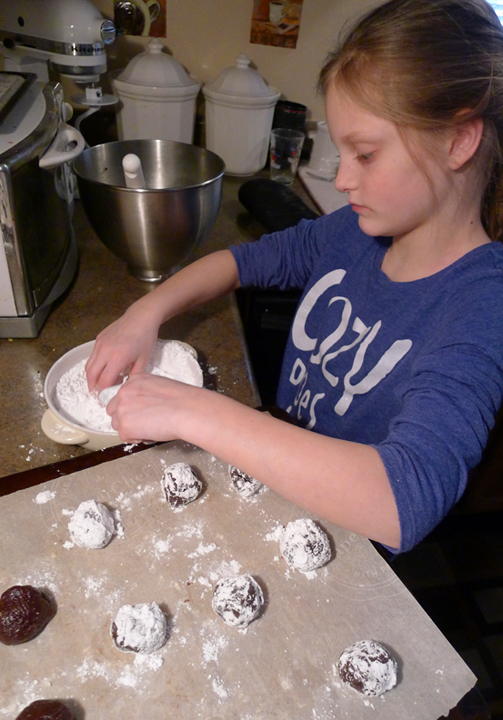 Use a toothpick to dip each ball into chocolate mixture and place back on baking sheet. 7. 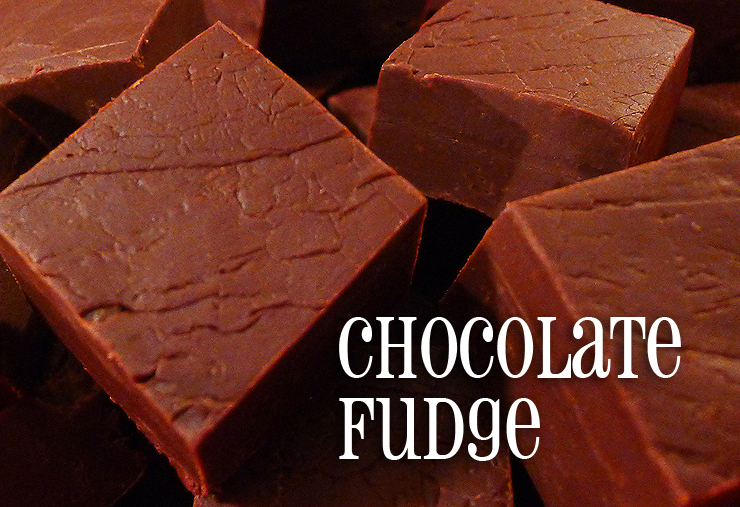 Refrigerate until chocolate is set. (About an hour.) Use the back of a spoon to smooth over toothpick holes. 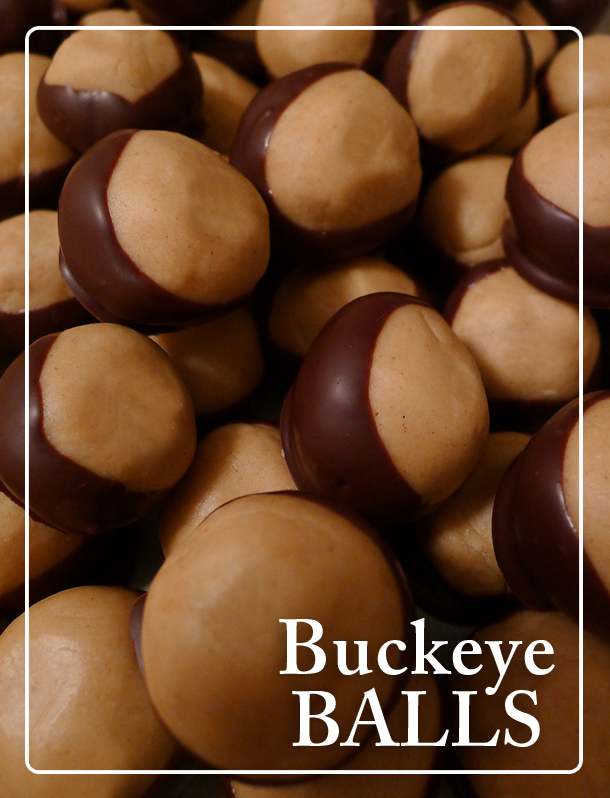 This entry was posted in baking, holiday, recipes and tagged baking, balls, buckeye balls, chocolate, holiday, peanut butter, recipe. Looking for an inexpensive, fun and easy holiday gift to give? This is the gift that keeps on giving! It’s a Hot Cocoa filled Christmas ornament. 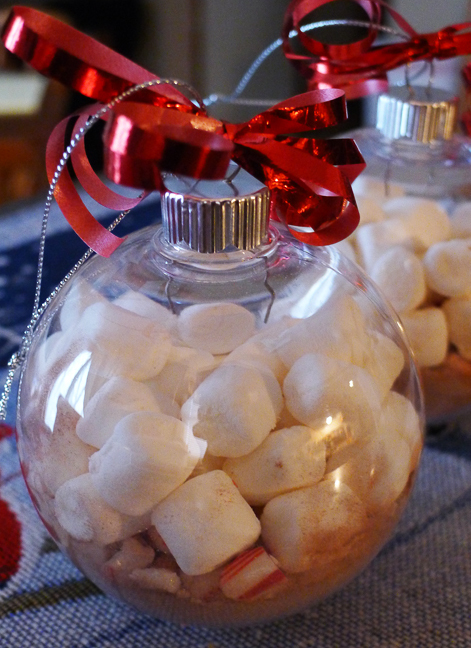 Your gift recipient can hang the ornament on their tree, then when the Hot Cocoa craving kicks in, Voila! There’s some hot cocoa to drink. 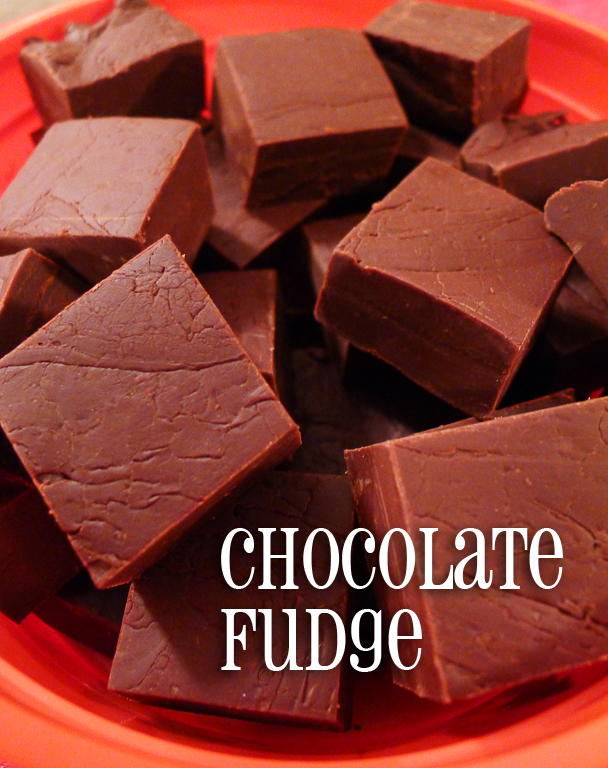 Just dump the contents into a cup of boiling water and it’s an instant chocolate treat. And it’s really easy and did I mention, inexpensive? Open the clear ornaments. 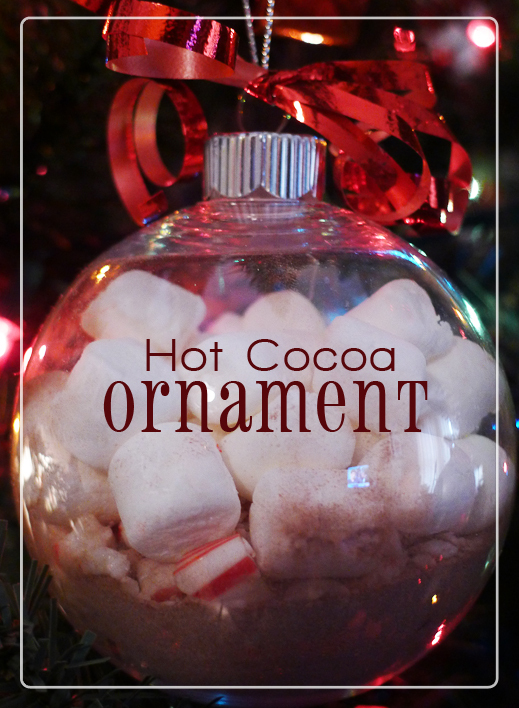 Use a funnel to pour the hot cocoa mix into the ornaments. I used 3 packets to get the level I wanted. 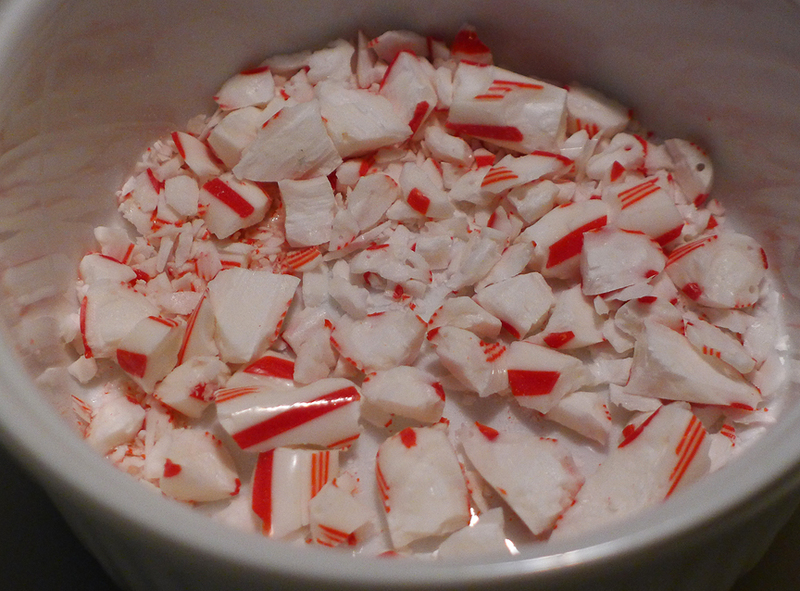 Crush a candy cane and pour that into the ornament. Fill the remaining space with mini marshmallows. Replace the top of the ornament, tie a bow on the top, and you’re done! Each ornament cost about $1.25 to make. They’re adorable and thoughtful and your gift recipients will love them! This entry was posted in crafts, gifts, holiday, thrifty and tagged chocolate, craft, gifts, holiday. 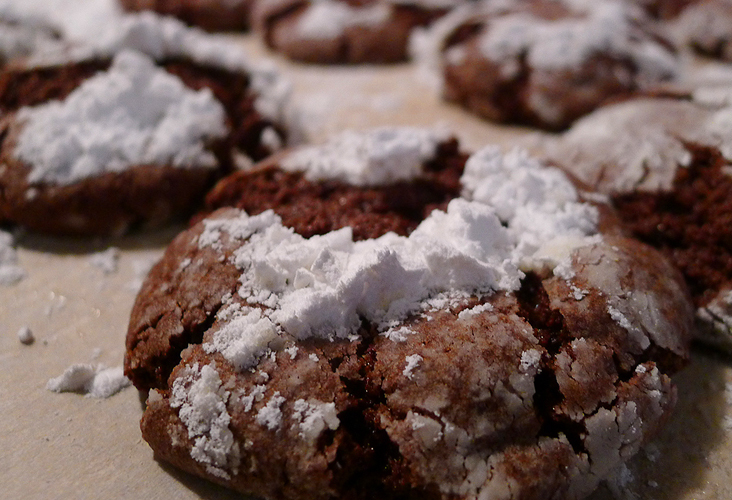 If you’re looking for a simple, fun and delicious treat to bring to holiday gatherings, this could be the one. You only need 3 ingredients. 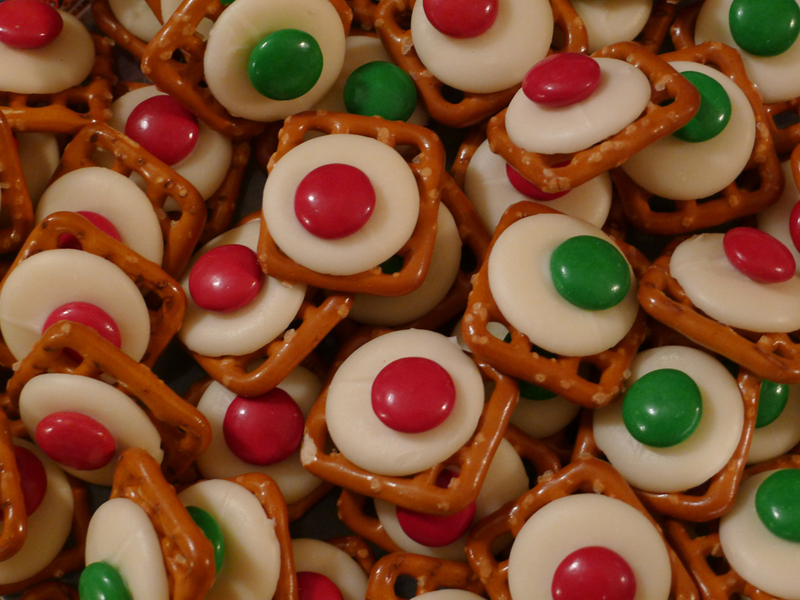 A bag of square pretzels, (you could use other shapes, but I have found the squares work the best), a bag of holiday green & red M&M’s and a bag of chocolate (or vanilla, as pictured) candy discs that you can find at craft stores such as AC Moore or Michael’s Arts & Crafts. Arrange the pretzels on an ungreased cookie sheet. 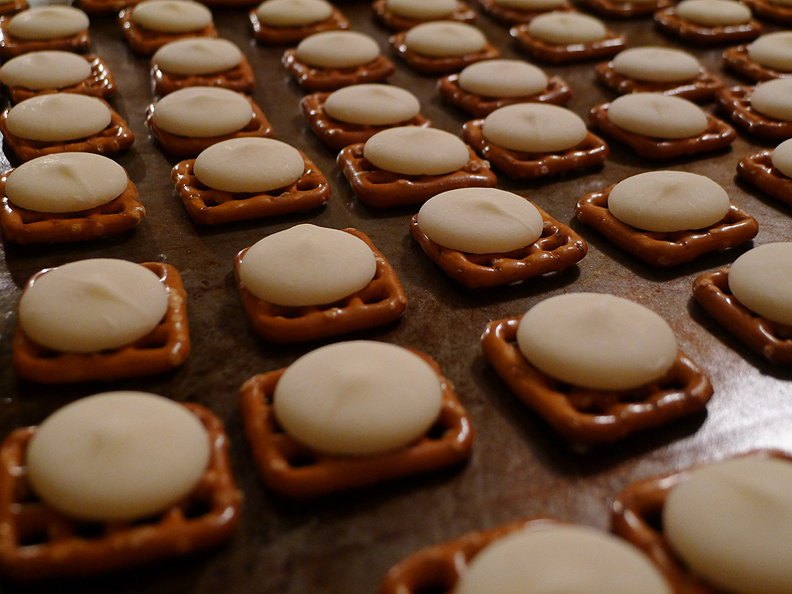 Put the vanilla (or chocolate) flavored discs on top of the pretzel. Pop in a 275 degree pre-heated oven for 2 minutes. Yes. You read that right. TWO minutes. Not long at all. So don’t leave the room or forget about them. 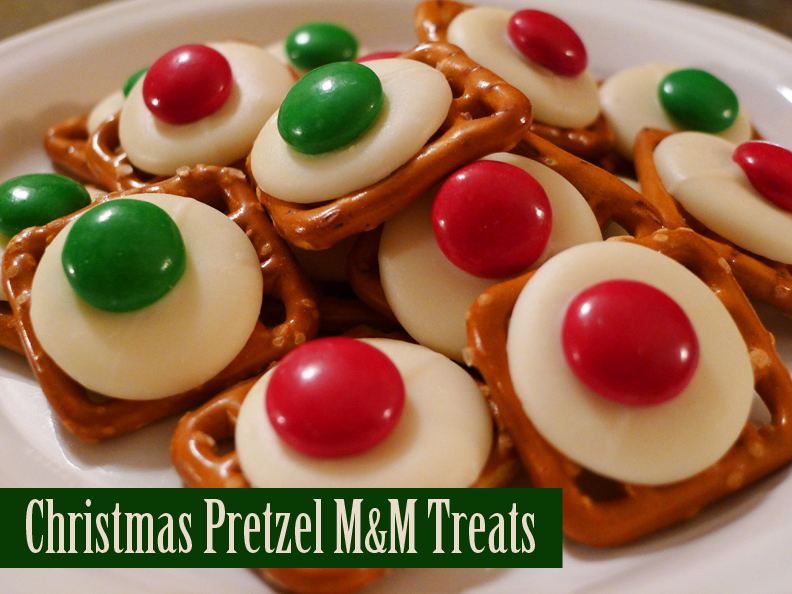 They will melt through the holes in the pretzels and make a huge mess. 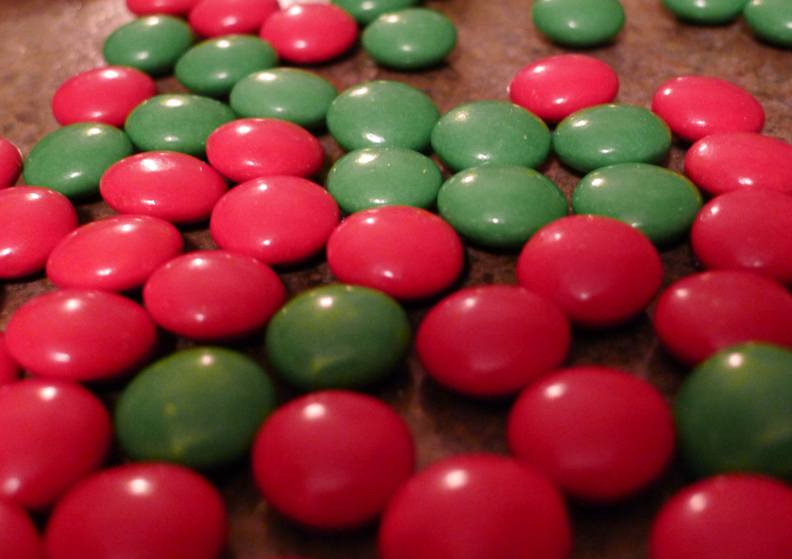 Have your M&M’s ready to place on top of the warm fresh-out-of-the-oven candy. Do this part quickly, get help if you can. You’ll need to do it fairly quickly or the chocolate disc will harden and the M&M won’t stick. And by quickly, you will have a few minutes, it’s not an emergency situation. Just do it as quickly as you can and waste time sipping your coffee between placing each M&M. Because it is winter here in Upstate NY, I set the tray of pretzel treats in the garage for 15 or so minutes so the chocolate solidifies quicker. Otherwise it will take a while before you can put them in a container to store. Or, you can eat them right away and not have to worry about storing them at all! 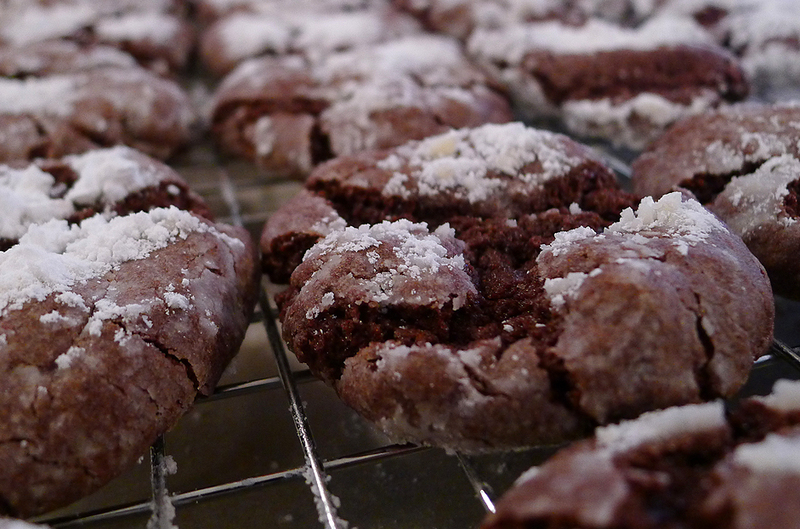 The neat thing about this treat is that you can make one tray or 5 trays. Or just a few treats at a time if that’s all you want. The clean up is minimal. The prep time is short. The outcome is delicious. 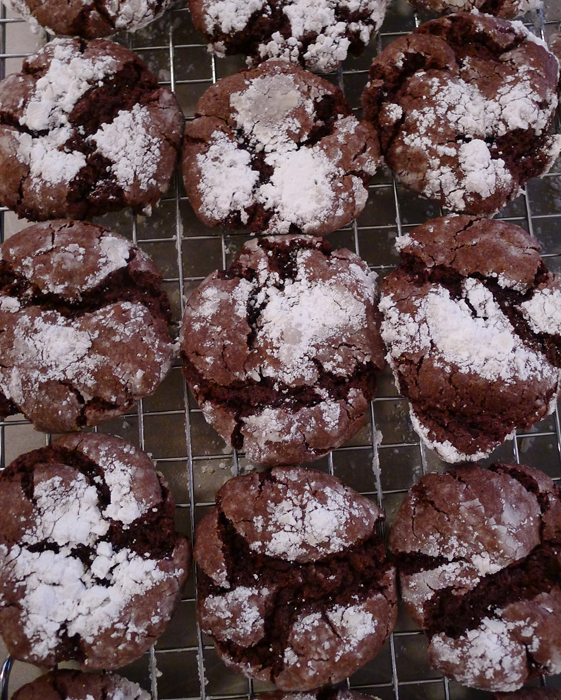 This entry was posted in baking, holiday, recipes and tagged baking, chocolate, christmas, dessert, holiday, m&m, pretzel, treat. 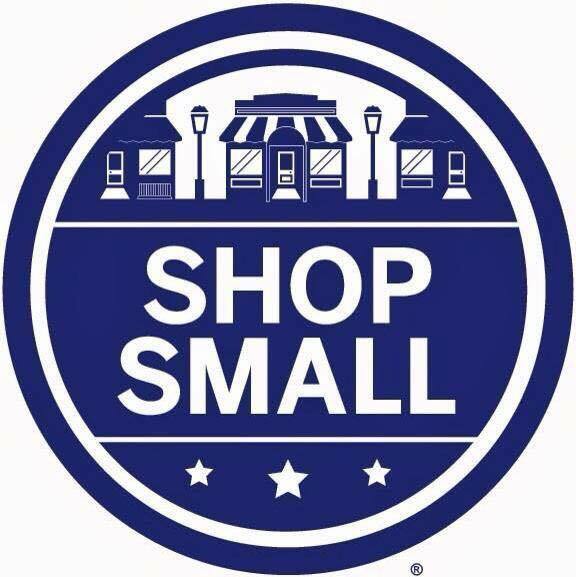 It’s Small Business Saturday! I hope that you all got out to support at least one local business today. More if you were able. My husband and I went to our favorite local donut shop. “Just Donuts”, located in Phoenix, NY. 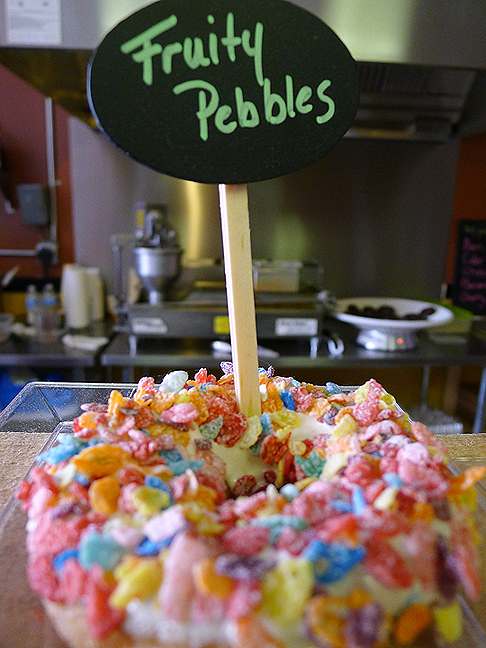 They are a small locally owned donut shop in a small town in Central NY. It is owned and operated by the Police Chief’s wife. They’re good people. Their business was broken into not too long ago, but thankfully they found the person who did it and they were back in business in no time. When you enter the small shop, the first thing you do is pick your donuts. Depending on the time of year and season, the flavors differ slightly. I heard there’s a gingerbread donut for the Christmas holiday. Can’t wait to try that! 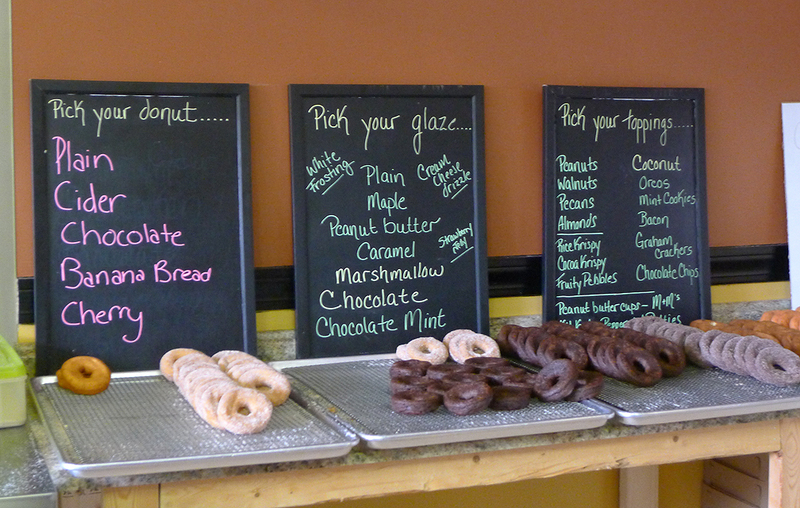 After you pick your donuts, you pick your glazes and/or frostings and then if you’d like some fun toppings for your donuts, you can pick those too! They have samples on display to help you choose, or you can make up your own. The combinations really are endless. 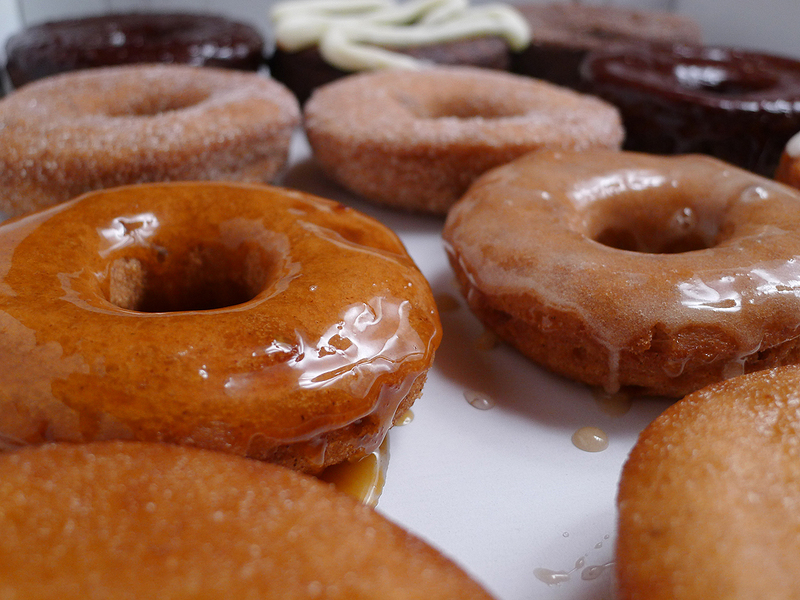 My favorites are the cider glazed donuts. (Maple glaze, plain glaze or caramel glaze… oh my.) They have a neat special on Football Sundays called Chicken Wing Donuts. Wear your favorite team’s NFL jersey and get $1 off a dozen! 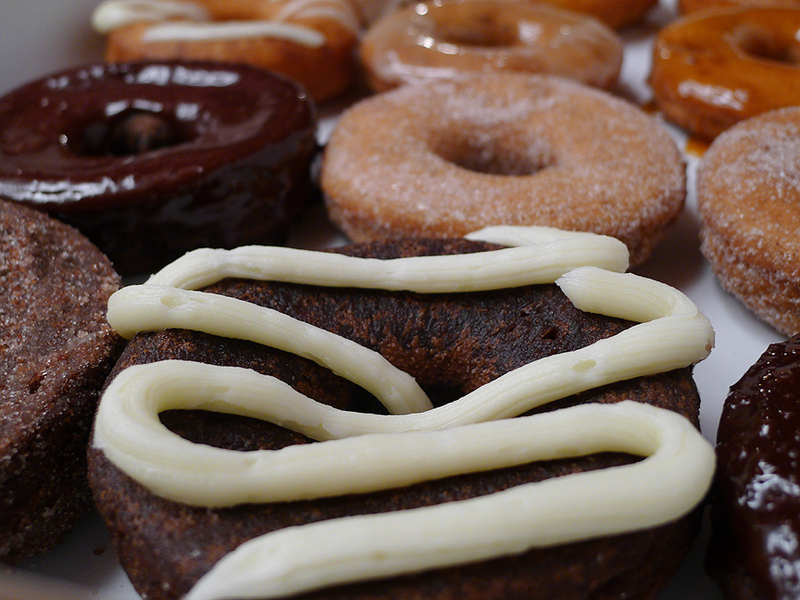 Check out the Just Donuts Facebook page, and if you’re in town, stop by! They are located at 219 County Route 57 Phoenix, NY. Hours are 8am to 1pm. This entry was posted in local, shopping, thrifty and tagged chocolate, cider, donuts, frosting, glaze, just donuts, shop local.